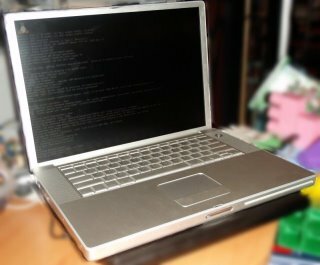 One year ago I bought refurbished 15” PowerBook G4 from Apple web-store (no more PPC models are there now) for $1411 (including taxes and free shipping) to play with Debian GNU/Linux port for PowerPC. This laptop has PowerPC G4 processor running with frequency 1.67 GHz, 512 MB RAM, 80 GB HDD, DVD burner. Also it includes installation disks with MacOS X 10.4. I made it dualboot: Debian GNU/Linux 4.0 “etch” (boot by default with partition 50 GB plus swap 2 GB) and MacOS X 10.4 (second optional boot with partition 20 GB). 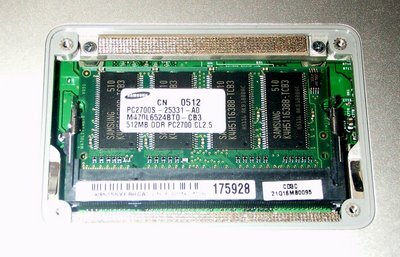 Also I made special 6 GB ext2 partition for data copying between OSs (ext2 drivers for MacOS X are available on sourceforge.net). Now I’m thinking about upgrading memory to 1 GB, but I don’t know should I use exactly the same memory (Samsung) or I can put any compatible (PC2700) 512MB to second memory slot?